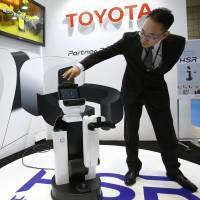 Toyota Motor Corp. is harboring big ambitions to become a significant player in the growing market for robots that help the elderly and others get around in everyday life. The company believes it can use its manufacturing expertise to become as crucial in a field it calls “partner robots” as it is to automobiles. The robotics engineers at Toyota number only 150 out of a worldwide staff of 300,000, but it is plowing money into research and development. Toyota last month announced a $1 billion investment in a research company headed by robotics expert Gill Pratt in Silicon Valley to develop artificial intelligence and robotics. It has also been working on robotics projects with Stanford University and the Massachusetts Institute of Technology. The government is banking on robotics as a growth industry in a society that is aging at a faster pace than any other industrialized nation. Other companies have jumped in, including Internet company Softbank Corp., which is selling a humanoid that carries on simple conversations. At a Tokyo robot show earlier this month, Tamaoki said Toyota’s robotics interests go back decades, including their use in manufacturing at its auto plants. But it now sees the technology as a viable business in its own right. Some of that impetus comes from the shift in focus by the auto and tech industries to using artificial intelligence to develop cars that can drive autonomously. Google Inc. is trialing driverless vehicles and Toyota rival Nissan Motor Co. is so confident about the technology it plans to start selling such vehicles by 2020. Honda Motor Co. has been a leader in robots with Asimo, the walking and talking child-shaped robot that’s been in development for more than two decades. But critics say the effort got sidetracked by focusing too much on duplicating human movements and behavior, and lost sight of ways to be useful. Honda officials acknowledge the company went through some soul-searching after getting targeted by public criticism when Asimo could do nothing to help people affected by the March 2011 Fukushima nuclear disaster. 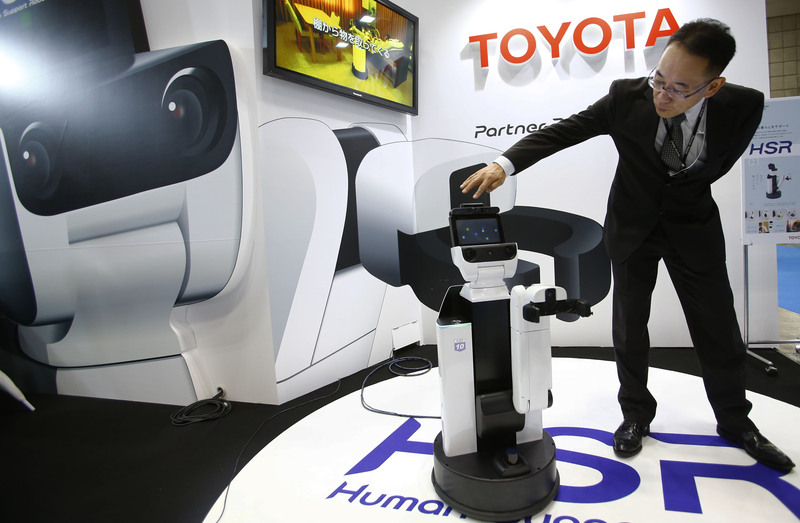 Toyota demonstrated a one-armed partner wheeled robot loaded with sensors and cameras, earlier this year. The R2-D2 lookalike, known as the Human Support Robot, can pick up after people, bring an item to the bedside or open curtains. An improved version of a model first shown in 2012, the HSR is not yet for commercial sale. Toyota is collaborating with 10 universities in Japan, with plans to extend that to overseas academic organizations next year, to develop practical uses, Tamaoki said. Among developments in the works for HSR is another arm, which will allow it to perform more complex tasks, and conversational skills. It now comes with a flat panel that works like a videophone or video player, but can not talk.